Maintaining optimal oral hygiene is important during the duration of wearing braces. Braces do not imply an automatic pause in oral care while the alignment process is happening. If you’re trying to decide which toothbrush is right for you during your alignment process of wearing braces we can help with that decision. The bottom line is that any tool is only as effective as the person operating it. Therefore, both a manual and electric toothbrush will do the job of cleaning your teeth, but you play an integral part in their effectiveness. In either case, choose a toothbrush with a soft head that fits appropriately in your mouth. Soft toothbrush heads coupled with gentle execution of your brushing will help you avoid damaging your wires and brackets. A manual toothbrush will clean your teeth effectively, but there are benefits to an electric toothbrush that can help ensure you are getting your optimal brushing each time. Most electric toothbrushes have a timer on them, signaling when your two-minute brushing is done. Electric toothbrushes are also wonderful for patients who have limited dexterity or arthritis. They also help control the intensity in which you brush to ensure you’re not damaging your gums or brackets. When using an electric or manual toothbrush while wearing braces, be sure to brush above and below the armature of the braces and to carefully navigate around your bands, brackets, and wires. 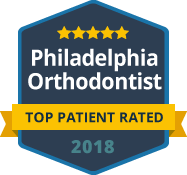 Book your appointment with Broad Street Braces today, and be sure you brush at least twice a day while wearing your braces and floss one time a day.